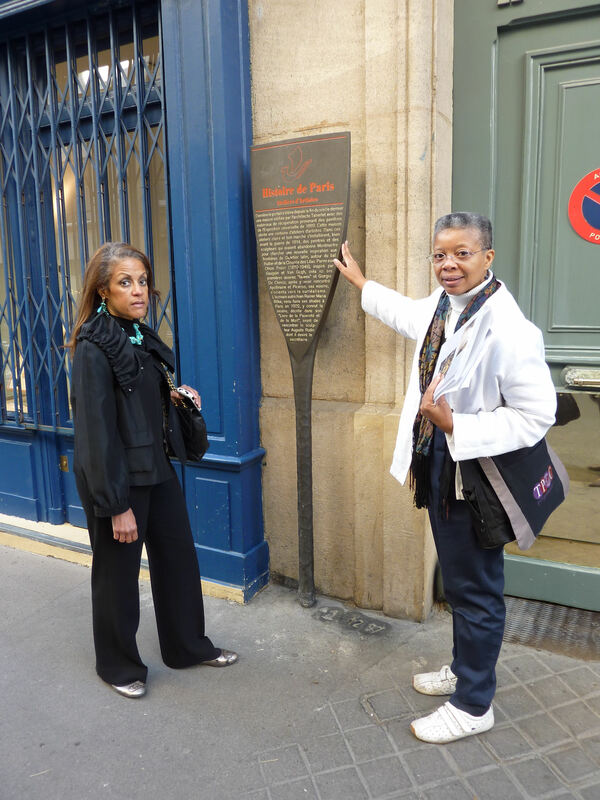 Entrée to Black Paris Tours has become an indispensable element of my abroad class, Black Writers in Paris, which I have been teaching since 2005. 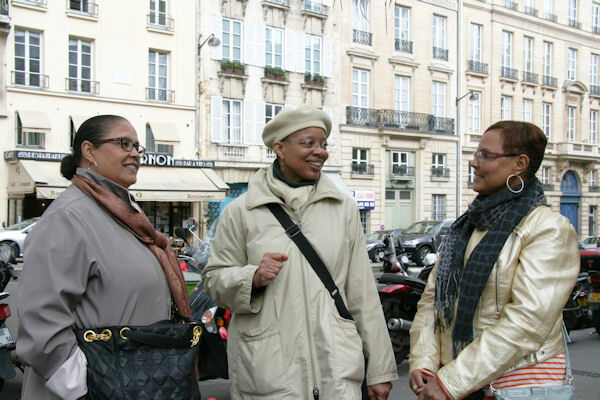 Dr. Monique Wells brings a scholar’s deep knowledge and passion to the many aspects of Black Paris’s history. The walking tour “In the Shadow of Montmartre” is always very popular with students. Dr. Wells is a dynamic lecturer who can offer a wealth of information in an engaging way. One student said, “I turned into a child when we went on the walking tour around Montmartre. To even walk on the same streets as the great black artists and thinkers of their time was surreal. I felt blessed to see the places where these greats were, in particular, Langston Hughes.” Another student wrote that “One of my favorite parts of the tour was when we learned about the way in which jazz transcended racial, social, and economic lines in Paris.” My students love how effective the tour is in bringing a vanished and wonderful black past to life on the streets of modern Paris. "The Black Pearl Walk" is a great little guide by Discover Black Paris. Very interesting! A highlight was walking past an old house that once published the works of Black writers (it is now a fish market) and going past Le Select, a restaurant that opened in 1925 and that was a popular gathering place for African Americans. The guide shared that Chester Himes wrote A Jealous Man Can't Win there and that James Baldwin used Le Select as the setting for his novel Giovanni's Room. The writer in me is VERY excited...as is my inner historian! Monique Wells of "Entrée to Black Paris" provided our family with an exceptional tour of the influence of Blacks in Paris after WWII. We believe that we could not have received such a thorough perspective, if not for our tour with "Entrée to Black Paris." We highly recommend that everyone take this tour for a fascinating perspective of this wonderful city. Just last week I took my life-long dream vacation to Paris, France. To say I had a wonderful time does not do my experience justice. 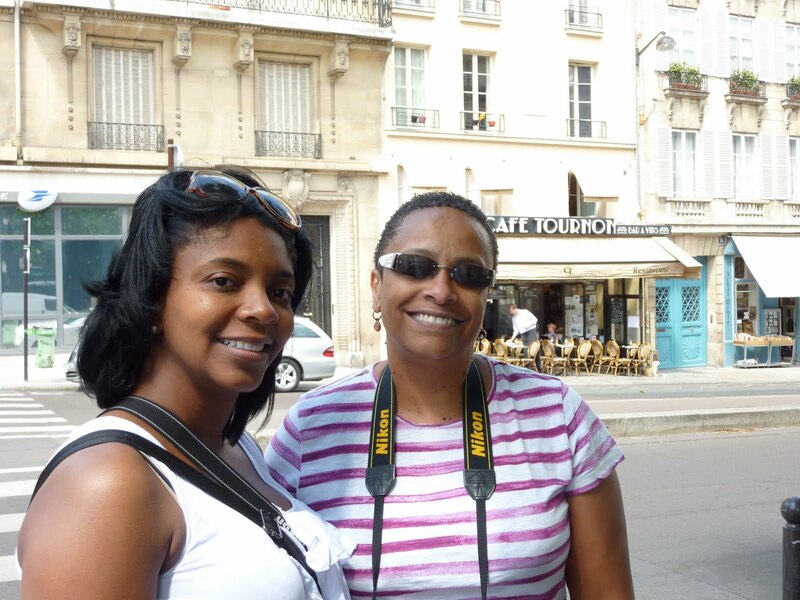 I, along with my sister, took in all the noted tourist attractions: The Louvre Museum, the Eiffel Tower, Notre Dame Cathedral, Arc de Triomphe, the home of Monet, and Palace Versailles, just to name a few. My week of excitement culminated with a tour given by Ms. Monique Wells, of Entrée to Black Paris. When I learned of my trip, which was a gift from my daughter, also included was information on Entrée to Black Paris. I signed up to receive information Ms. Wells posted on her blog, and for nine months I followed her informative posts. 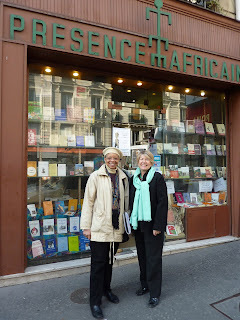 I, also read her books, Black Paris Profiles and Paris Reflections: Walks through African-American Paris. I had read and heard stories of black Americans living in Paris and wanted to learn more. This was not the usual run-of-the-mill tour. 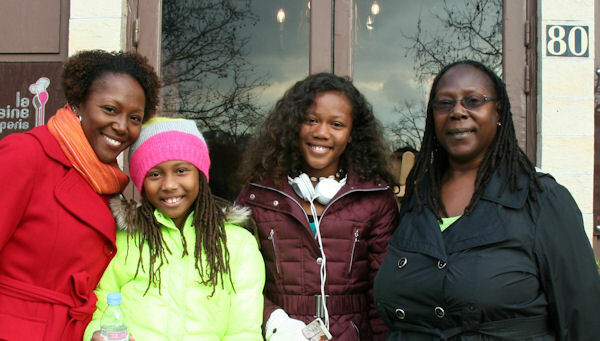 This walking tour focused on the lives and accomplishments of Black Americans along with other black expats. Monique’s casual style made for a wonderful stroll through the streets of Paris that other tours did not offer. She was a wealth of knowledge about noted persons such as J. Baldwin, R. Wright, C. Himes, and A. Dumas. 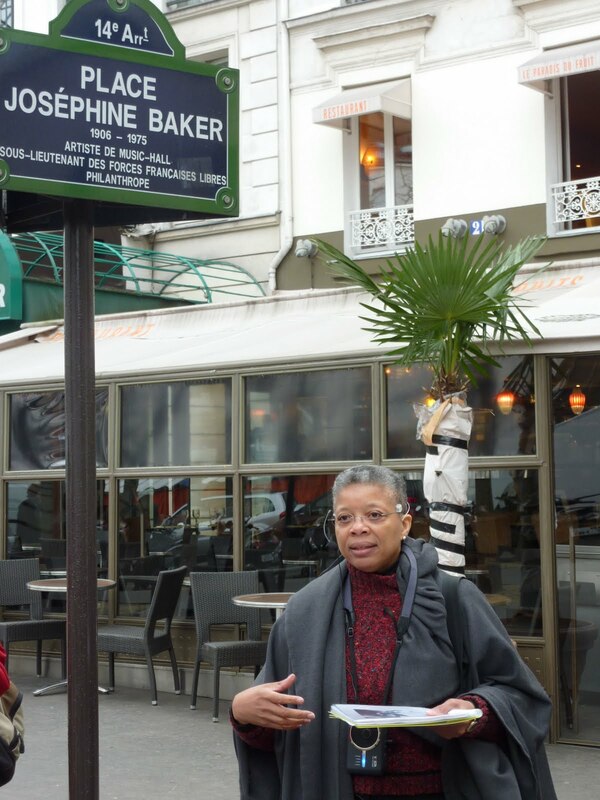 Her stories made for a visual of how black people lived their lives in Paris after WWII. She peppered facts with tidbits of little-known information, most quite humorous. If you know anything about the great black writers, poets, artists, performers, and political activist of post WWII, this tour will enhanced your understanding of their lives. I wish that I had scheduled a longer time for the tour, because I felt that Monique was just getting started. The tour was so intriguing that I had a renewed interest in many of the names mentioned. The Entrée to Black Paris tour was the highlight of my dream vacation, so if ever you plan a visit, be sure to include it in your itinerary. On my next trip, I definitely will. One of the highlights of our stay in Paris was "The Entrée to Black Paris Walking Tour" in the Montparnasse district. Monique's passion for art and the artists was contagious. History ceased to become a relic and became a living, breathing entity when Monique began to speak. Walking down the Parisian streets, seeing the dwellings of the artists and the establishments which they patronized and sold their art was so inspiring we decided to become involved with Les Amis de Beauford Delaney. If you want to experience Paris as the artists who lived in the Montparnasse district and see and learn about a part of Paris that only insiders know, you would be remiss if you didn't take "The Entrée to Black Paris Walking Tour". 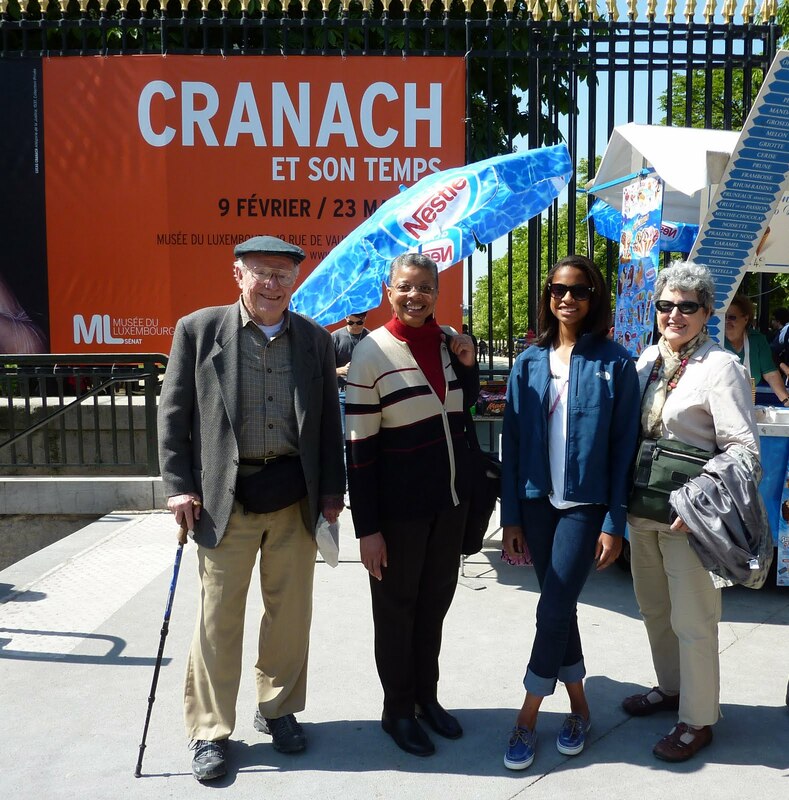 Dorothy M. Miller is an 82-year-old traveler who flew to Paris solo during the summer of 2011 and took our one-day, self-guided, “African-American History in Paris” walking tour. She asked us to post her comments below in the hope that they will serve as inspiration for other seniors who are thinking of venturing out on their own. 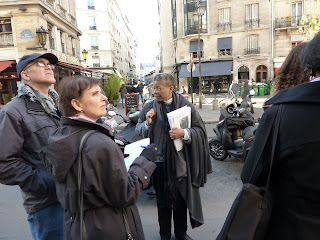 I engaged Entrée to Black Paris for a bus tour of Paris that featured French and black history for my group of sixteen travel professionals. Our guides, Monique Wells and Tom Reeves, were prompt, flexible, and well prepared for our excursion. They are personable and knowledgeable tour guides who work well together as a husband and wife team. 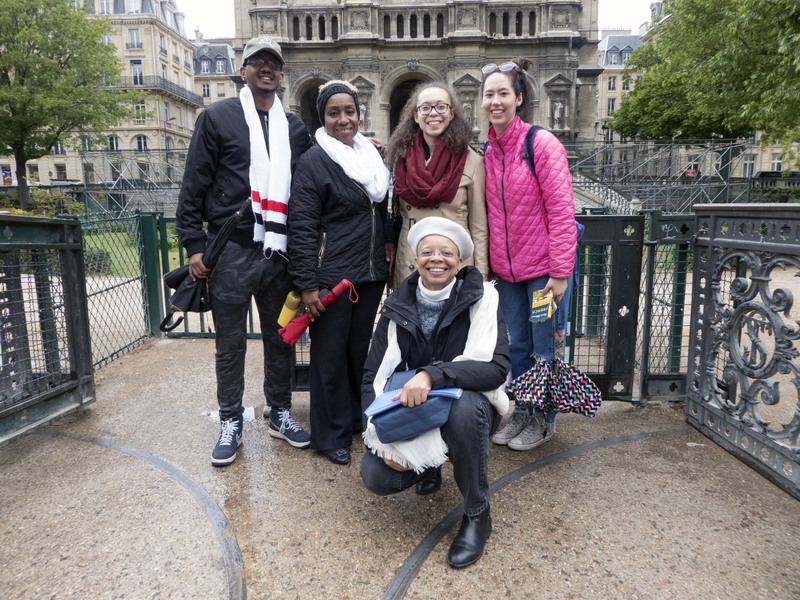 The tour was very informative with regard to French history and black history, and all participants were intrigued and pleased with the facts and anecdotes presented. From creative walks and professional presentations, Entrée to Black Paris leverages their treasure trove of knowledge offering an insight into the literary and cultural heart beat of Paris - past and present. Having such a resource made for a wonderful partnership, adding to our year-long programming for members (in the case of the 20th Century Literary Women walk) and for our general public (in the case of the Black Paris/Myth of a Colorblind France presentation). Looking forward to continued collaboration! We'd spent hours in the beautiful grounds of the Luxembourg Garden on each of our several visits to Paris, so when we decided to make the trip with our granddaughter Katie, we arranged for a Black History Tour with Monique Wells, with the garden as the heart of the walk. We thought that perhaps it would add a little interest for us on yet another stop at our favorite garden. Oh, my! We'd never really seen the garden at all. 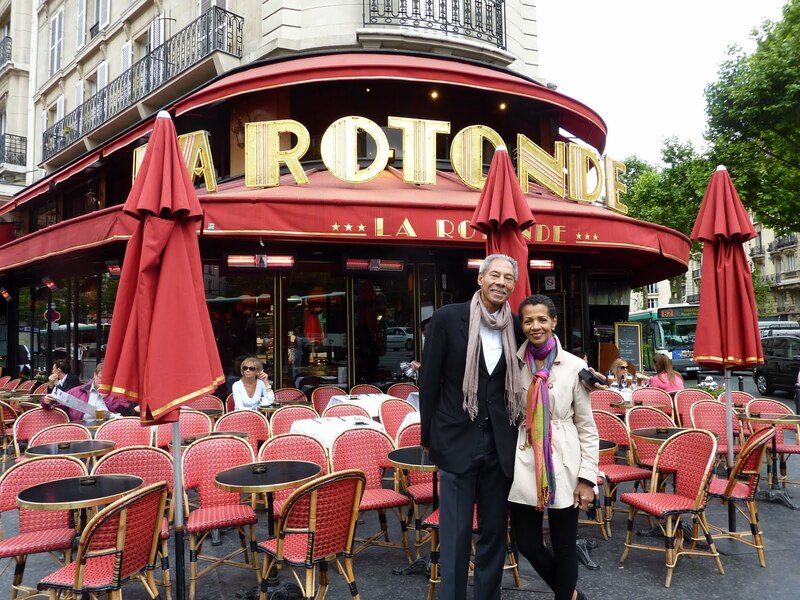 The lively, vibrant culture brought to Paris by Black writers, artists, and musicians through several decades - and the lively, vibrant culture offered to them in return - is at every turn, both outside and inside the garden. Josephine Baker, Chester Himes, Richard Wright, Lois Mailou Jones, those jazz clubs - came to life for us. And there was the Statue of Liberty surprise as well. We ended our tour at Fabrice Hyber's art installation, "Le cri, l'ecrit" commemorating the abolition of the slave trade in France. If we'd had another week, we'd have booked a tour with Monique every day. Maybe next year! On a glorious spring day in Paris, I met Monique at Maubert Mutualite in the 5th arr. 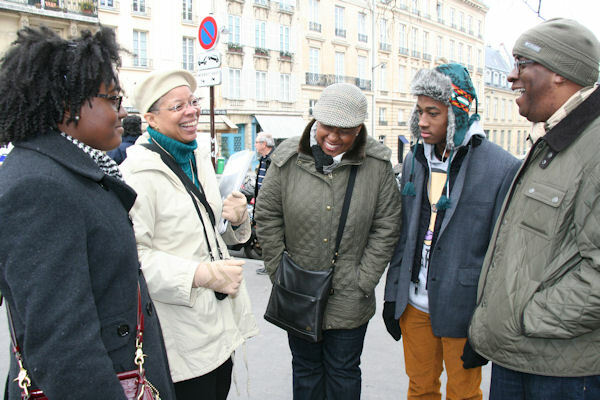 to walk and talk about Black Paris after World War II. Coming from Australia, this is certainly an area which does not even remotely come into our history lessons. I found Monique’s knowledge and descriptions of the lives of many of the Black writers and artists to be fascinating and informative. 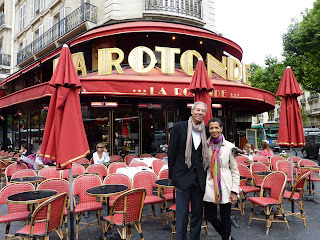 We walked along the streets where they worked and lived and saw the cafes where they no doubt spent many hours, and learnt of the many influences they have played in the establishment of the Black literati in Paris. I thoroughly enjoyed my morning, would certainly recommend it to people who are interested in the history of Paris, and I will definitely look for more books to read on this subject. For information on Entrée to Black Paris™ tours, click here. For anyone looking for a tour with a warm and knowledgeable guide that goes beyond the usual monuments and landmarks, I highly recommend taking a Entrée to Black Paris tour. It was such a pleasure to spend the morning with you and have our own private chance to talk and listen. I got so much valuable information and enjoyed meeting you immensely.... Somuch of what you explained and filled me in on is important for my work. I was fortunate enough to take two private tours (“Black Paris after WWII” and “Rendezvous Eighteenth”) with Entrée to Black Paris recently, and cannot find enough superlatives as descriptors. Monique Wells is not only overflowing with a wealth of historical knowledge, but also has a memory-bank full of anecdotes, legends, gossip, etc. that adds tremendously to the experience. “Black Paris after WWII” dispelled many of the notions I had about the travels and eventual move of many African Americans to Paris. Although there are a myriad of sites relevant to and part of the lives of the likes of James Baldwin, Buford Delaney, Chester Himes, and Richard Wright, their lives were equally intertwined with Charles de Gaulle, Gertrude Stein, Sylvia Beach, Pablo Picasso, etc. It was Monique’s bringing together of the interactions of these two groups and how these interactions affected both specifically the lives of blacks in Paris and the wider literary and artistic society as a whole that was so fascinating and filled in so many blanks for me. And “Rendezvous Eighteenth” was a real eye-opener; having very little knowledge of this part of Paris, this walk has made me want to explore the area in more depth. It was interesting to not only put oneself in the scenes of Jake’s book, but also to learn how this area has evolved over the decades. I will definitely recommend these tours to others, and am looking forward to taking others tours with them myself. My number one reason (that I enjoyed my Entrée to Black Paris walk) was how well versed you were in the subject. Your level of knowledge and expertise was penultimate only to the beauty surrounding your lovely city. An Alien Parisienne (a blog) ...I said to Monique at the end of the tour, “This was a breath of fresh air!” for it really was. In a tourist industry that is focused on very white, upper-class pursuits and interests, this tour showed me a Paris that felt down-to-earth and real. 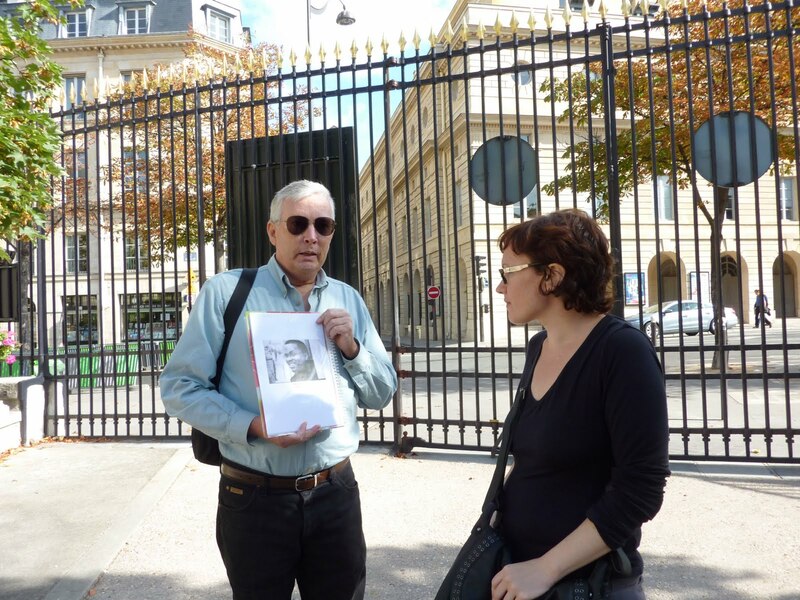 This tour did not show a “fantasy Paris” that glosses over some of the intense and bloody, discriminatory parts of French history, but a Paris that shows the city has drawn people from all socio-economic, cultural, and racial backgrounds and has a history rich in diversity. I loved as a bookish, literature-geek chick the emphasis on literary Paris in this tour. The tour begins outside Luxembourg Gardens, most commonly associated with two celebrated women who made Paris their home: the Italian-born queen and wife to Henry IV, Marie de Medicis, and American writer Gertrude Stein, whose literary salon was at Rue de Fleurus in close reach of the gardens. A lesser-known fact about the area, however, was that it has also been a hotbed for some of the most noteworthy black intellectuals, writers, artists and other historical figures, whether native French or immigrants. The Entrée to Black Paris tour purports to shed light on the notable people and places related to black history and artistic achievement in and around the Luxembourg Gardens. 30 Days in Paris (a blog) It is so much fun, and educational, to have a guide as knowledgeable and passionate about a topic as Monique. We wandered the streets of the Latin Quarter for 2 hours as she pointed out historic locations and told us about interesting facts about the black experience in Paris. Did you know the “Latin” quarter is called that due to the Latin language spoken here in the past. The area has strong educational / university roots. 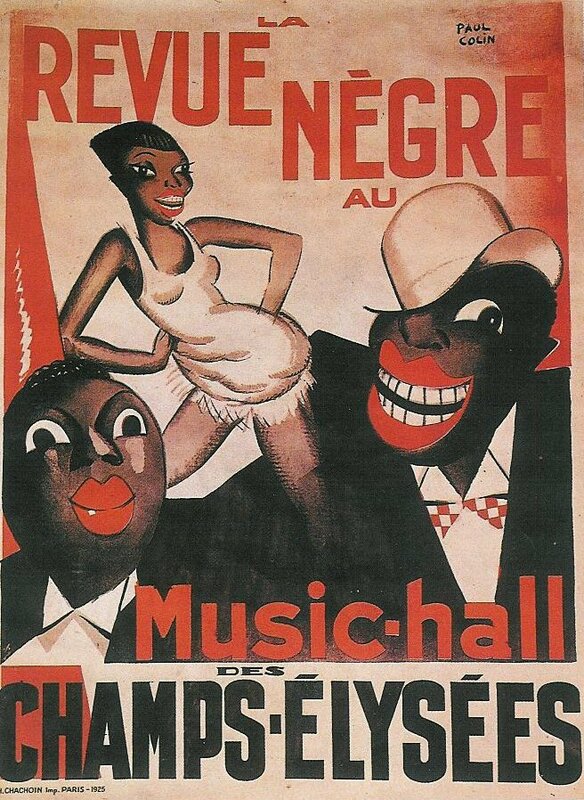 As a newcomer to Paris and Paris history, I was surprised to discover that African-Americans in Paris are just a small percentage of the black population. Paris is a melting pot of people of color from all over the world. But France has been slow to recognize this growing segment of their inhabitants. Monique brings today’s and yesterdays experiences to life.